Jane figures that there are few places worse than the mills of Lowell and Washington Territory sure sounds pretty good in the descriptions that Mr. Mercer gives. And so she's looking forward to their arrival in the frontier town of Seattle. Along with her widowed stepmother and half brother Jer, they set sail around the Cape and up the west coast. Dodging Spanish warships and visiting post-quake San Francisco, they survive several months at sea to arrive and find that Seattle is just a muddy mill town and hardly better than what they left. Jane, however, is a stubborn and sturdy girl who realizes that the only way you can make your way in the world is to do things yourself. With fortitude and a willingness to learn new things and take risks, she pursues a path that mixes conventional and unconventional, achieving a success that is hardly at all the end that she originally envisioned. 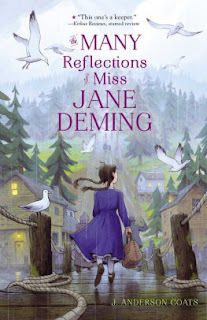 The conclusion is inspirational both in the sense of what it does for Jane as well as in motivating the reader to want to learn more about nineteenth-century life in the Pacific Northwest. If there's a fault to this beautifully-written and rich fictionalized account of frontier Washington, it is the lack of a historical note or a bibliography. Coats obviously knows her history and reveals a amazing collection of tidbits about the ways and mores of the time. It's the sort of thing that makes you crave for more and a reading list would have been very welcome. As for the story itself, Jane is one of those amazing inspiring characters. The obstacles she faces are horrendous but she overcomes each in modest ways, often surprising even herself in how she does it. Where tasks seem impossible, she finds a different way. Where Plan A fails spectacularly, she picks herself up and finds a Plan B. This isn't just some hokey "frontier spirit" thing, but the real thing. Coats pretty much is showing how real people worked through their problems and survived in the harsh conditions of the region of the time. It's not always perfect and it's certainly not pretty, but it gets the job done. In that way, Coats captures not only the historical details of the period, but also the mindset of the people. None of which is to say that this is a survival story. There's room in there for humanity as well, as Jane not only takes care of her material well-being, but also builds friendships, bonds to a family, and develops a sense of pride and self-identity along the way. A truly beautiful book and a gem of historical fiction.